Tovolo loves ice pops! For anyone who knows us, this is not news. I can tell you that the two things that are always in the Tovolo office freezer are ice cubes (in various stages of testing) and ice pops. Tovolo Pop Molds fall into two categories: classic and 3D silicone shapes. We have six classic shapes and nine 3D silicone Pop Molds to cover everyone’s pop needs! They are all easy to use and easy to clean. As the weather continues to show signs of warmer days ahead, my brain thinks of all things frozen. 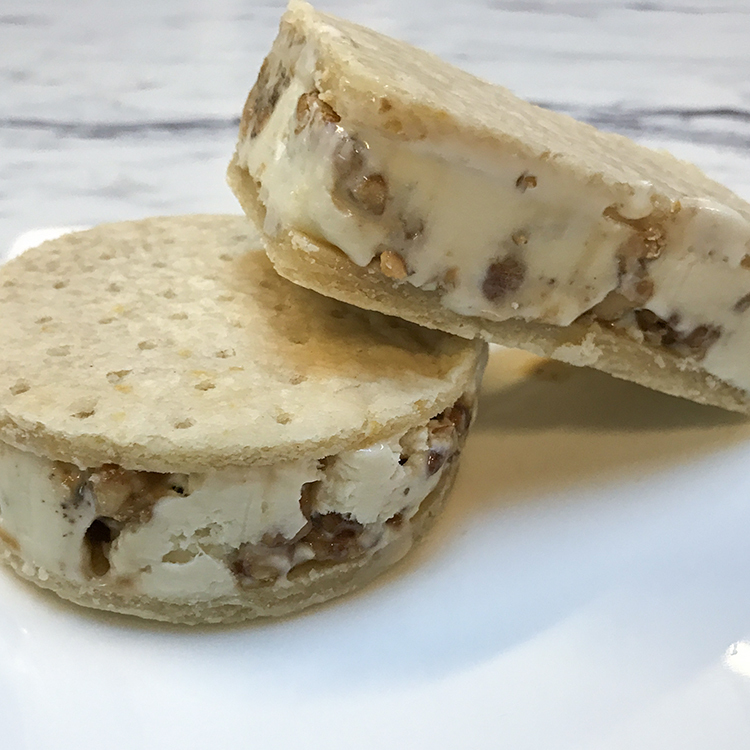 Ice cream sandwiches, slushy margaritas, and of course ice pops. Usually, ice pops are thought of as really high in sugar and mostly for kids. Well, I am here to tell you that those days are in the past. 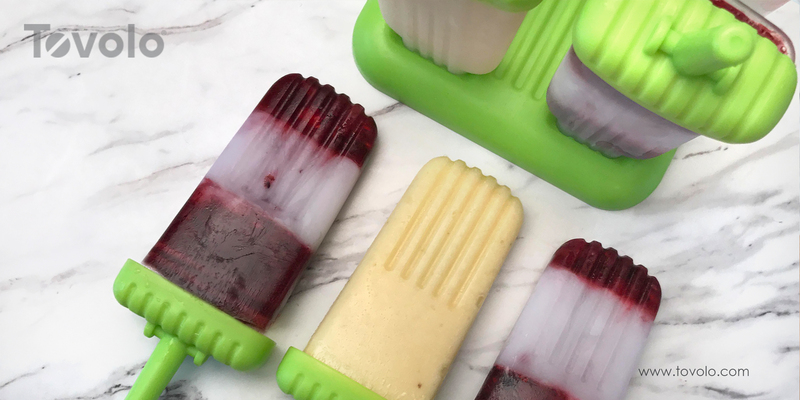 One search on Pinterest for ice pop recipes will tell you that ice pops have gotten a healthy upgrade. Do you make smoothies in the morning? I have a fun new twist for you! 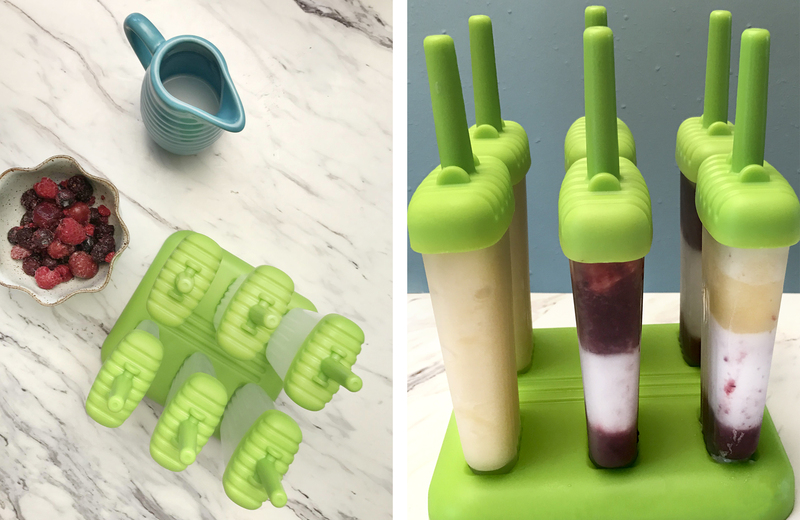 Next time you have a little extra smoothie in the bottom of your blender, pour it into a Tovolo Pop Mold. Frozen pops are an easy, on-the-go breakfast or snack – especially on a hot summer day. 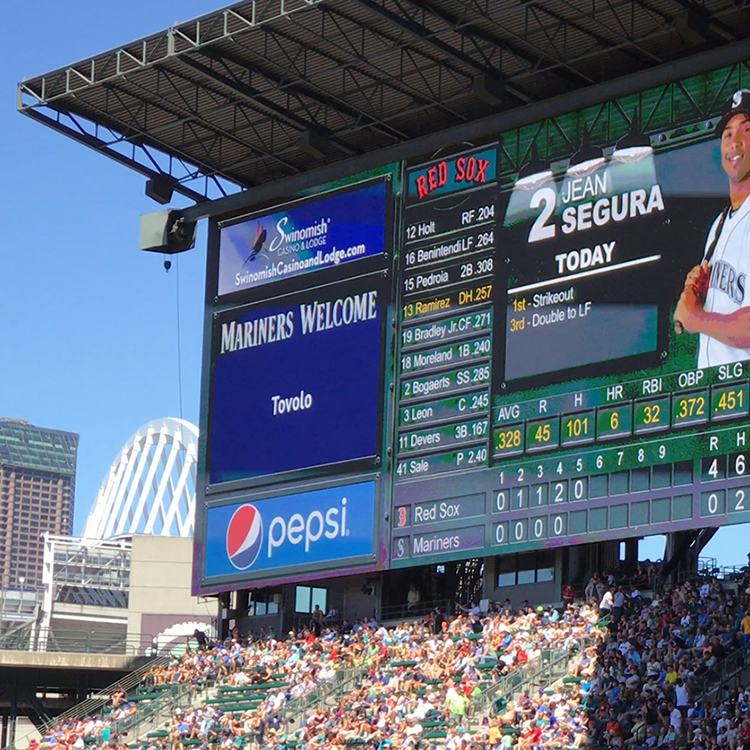 Now I am not saying you want to put on your best white outfit and drive one-handed with a pop in the other hand – please don’t do that. What I am saying is that having a few healthy pops ready to go in your freezer can make a “running late” kind of morning a bit less stressful. 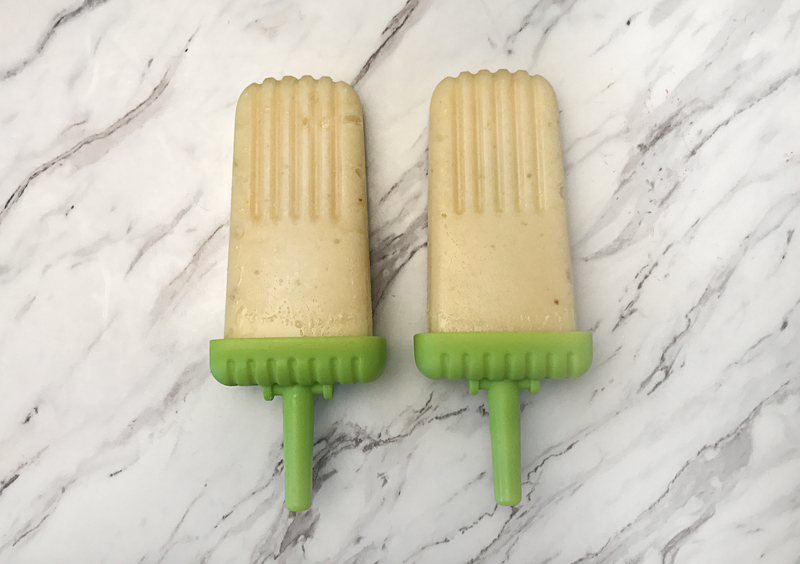 I made a few examples of healthy, super quick pops. I always have frozen fruit in my freezer. Today, I used organic mixed berries and frozen pineapple chunks. The berries for me give a little sweet, low-sugar zip to a mostly kale and carrot smoothie. Whenever I cut up a whole pineapple, I take about a quarter of the chunks and freeze them for just such an ice pop occasion. To make ice pops, you can definitely use fresh fruit but today I am using what I already had in my freezer. 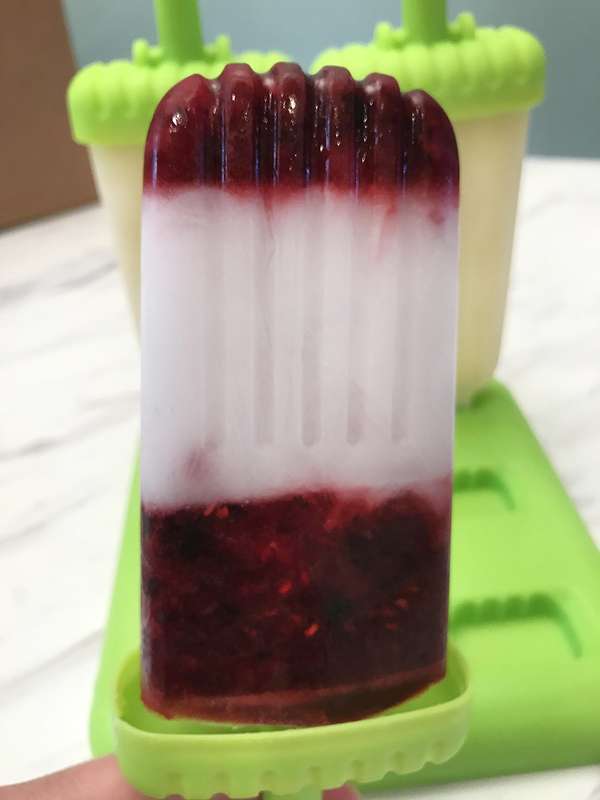 I am nothing if not fancy, so I am layering the berry and coconut milk pop. First blend a half-cup of fruit with 4 oz. of water. I recommend not blending it too smoothly so that you have a little texture in your pop, but go with your personal preference. 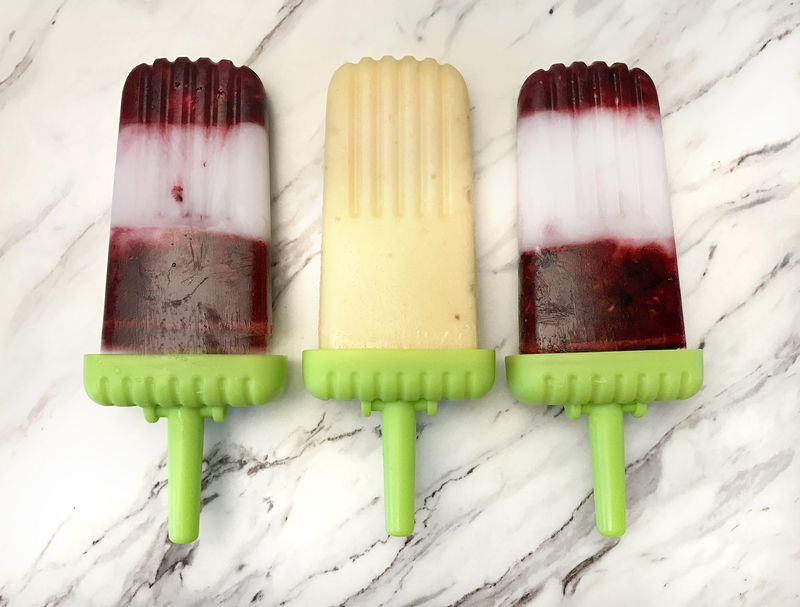 Carefully pour the frozen berry mixture into the pop molds to fill about ¼ of each mold. Freeze for about 15 minutes – this is why if you use frozen fruit the process moves a lot faster. 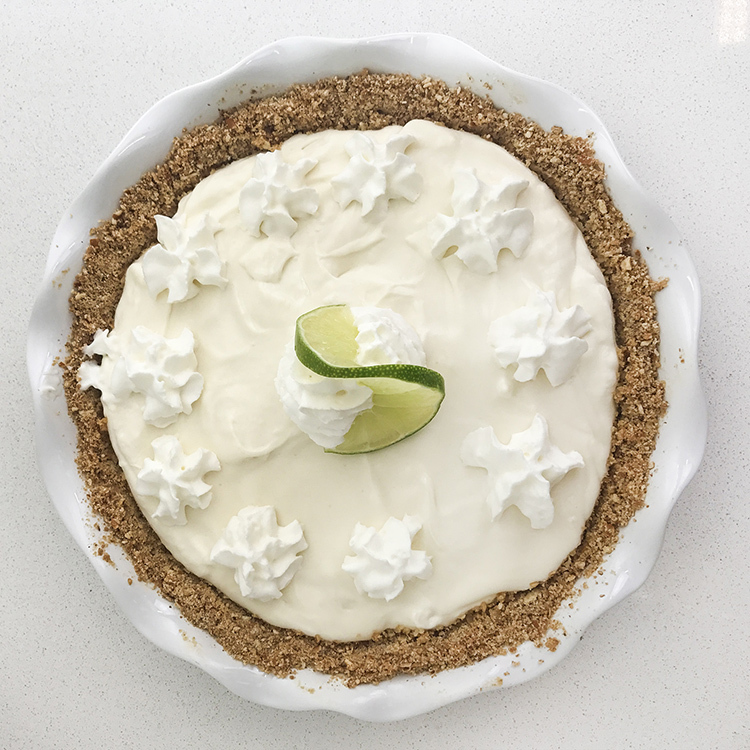 Then pour in the coconut milk (or equally delicious yogurt) and freeze for another 15 minutes. Then add the last of the berry mixture, carefully put in the sticks, and close the top of the pop. 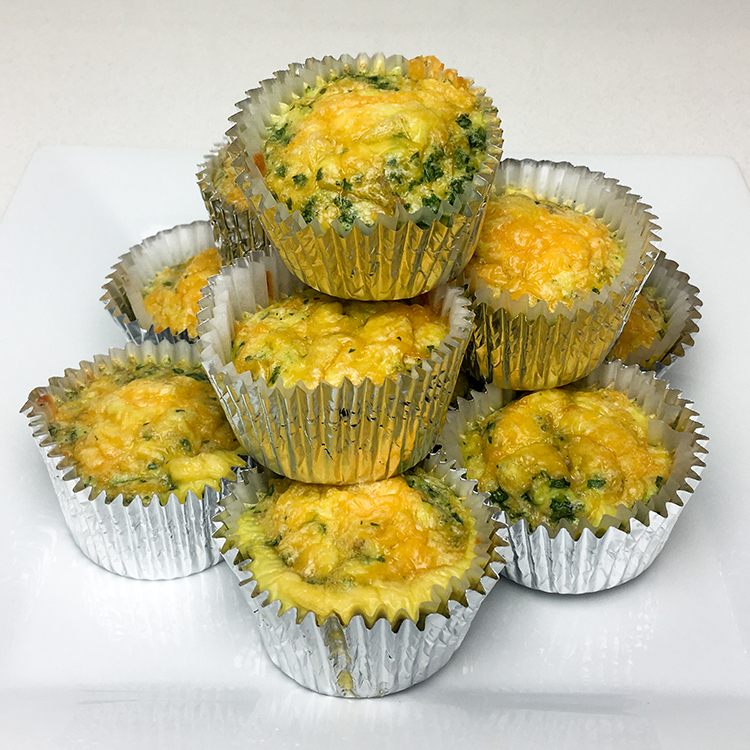 Let these freeze for a few hours or overnight. For the pineapple pops, blend ½ cup of frozen pineapple with about ¼ cup of water until smooth. I poured this blended pineapple mixture into 2 of the 6 molds but I had enough for 4 molds. That’s another great feature of the Tovolo Pop Molds – you don’t have to make all 6 pops the same! 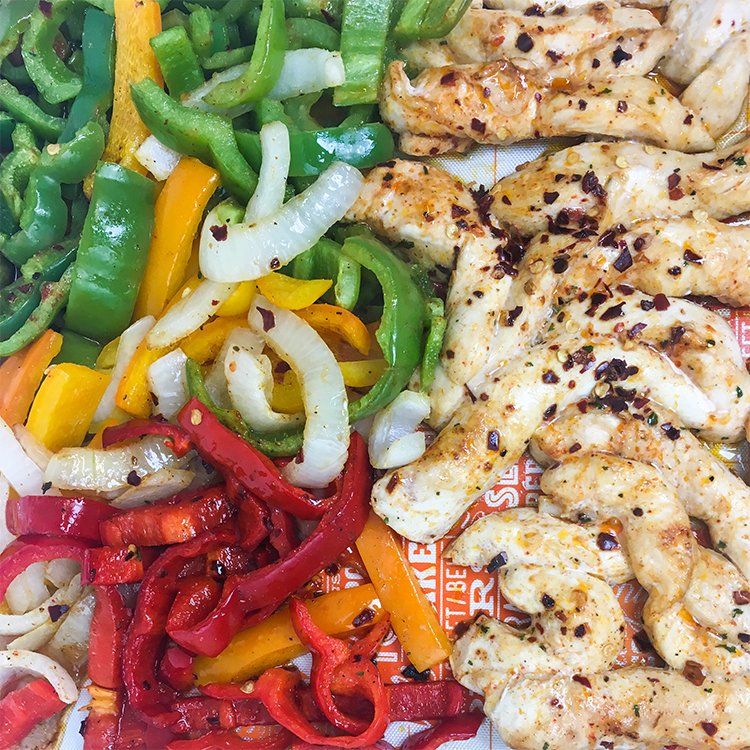 Some people like berries, some pineapple, so it can be nice to mix it up. To remove the pops easily, I run each individual plastic mold under warm water for a few seconds, dry the mold off, and then carefully wiggle the top of the mold until the pop slides right out. Ta da! No added sugar, no dairy, all organic, gluten-free, delicious and nutritious pops! You can use juice, fruit, yogurt, ice cream, chocolate milk – the sky is the limit! I haven’t tried cereal milk yet but I bet that will be my next Pop! 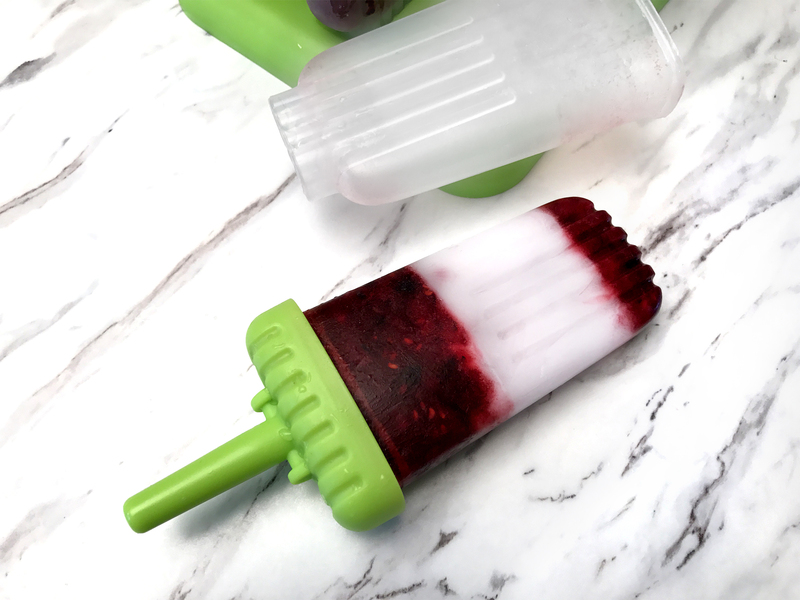 What’s your favorite healthy, homemade ice pop recipe?